Lisa started playing guitar at age 10. In college, she learned music theory and education, getting her degree from the University of New Hampshire. Since then, she's been a full-time touring artist, recorded five CD's of her original music, and received national recognition for her achievements: a Grand Prize in the USA Songwriting Contest, and First Prize in the Mixx Magazine Indie Band Contest. Lisa's influences include everything from classic '60s and '70s rock, world music, Latin, and jazz. Combine her talents and knowledge and you get one fantastic instructor. She has nearly 600 lessons on our site specializing in beginning techniques, and acoustic guitar approaches such as fingerpicking and strumming. Lisa created the foundational hub of Guitar Tricks' Core Learning System, with her new versions of Guitar Fundamentals, Levels 1 and 2. In this tutorial, you'll learn a whole new kind of chord, one which is actually moveable! Your fingers learn only one chord shape, but with that shape you can make any major or minor chord you want. No wonder they call it a Power Chord! By learning the songs and chords in this tutorial, you are not only opening up your ability to use power chords to play nearly any song you want - but also, building on an essential foundation that will make understanding the neck of the guitar much easier as we go forward. Now that you have learned a very important set of power chords by name, let's have fun helping you to make them second nature by playing some fun grooves and songs. Oh yeah, and a spelling bee! Let's build on what you've learned about power chords, with some essential music theory concepts every musician needs to know. In this tutorial, you'll learn all about how sharps and flats work in music, and on your guitar. And, how to play EVERY power chord possible, rooted on the 6th string. Learning to understand what the Major Scale is all about will open up exciting new doors to you as a guitar player! The Major Scale is a common language amongst all instruments, not just the guitar. In this tutorial, we'll learn what makes the Major Scale 'tick', and why. In this set of lessons, we'll learn a pattern of notes to play that will allow you to easily play the major scale, in any key you want. This streamlined system makes playing major scales super easy, and is the gateway to playing melody, riffs, and improvisations up the neck of the guitar. Trick yourself into practicing your major scales by playing along with the grooves in this tutorial. We will use what you've learned about major scales, and build on it to create real music. Get ready to have a blast, and, come away with a fluid and solid grasp of several essential major scales. In this tutorial, we will build upon your understanding of Power Chords, and reveal how a very simple and predictable graphic pattern on the neck of the guitar can be used to find the likely chords in any key. Now that you can name your Power Chords with 5th and 6th string roots, let's see what the 'Magic L' can do for us when we turn it upside down. Suddenly, you'll open up a whole new set of options for how and where to play a song on the guitar! Now that you've learned all about Power Chords and the basics of the 'Magic L', let's take it one step further, and use the 'Magic L' to tell us even more information about our chord options for playing in any key. No more counting on fingers - it's all right there in the pattern! The Major Chord is made up of a very specific and simple formula of notes. This formula applies to all major chords, no matter what instrument you play them on! Let's learn the formula, and put it to the test, to discover what every major chord has in common. The Minor Chord follows a very similar formula to the Major Chord, with only one tiny difference. Let's learn about how to build a minor triad, and a minor chord, and listen for how this completely changes the mood of the music! Going beyond straight-up major, and straight-up minor, is how we begin to add even more flavor, mood, and nuance to the music we make on the guitar. Let's explore adding additional notes to our basic chords, and listen for how this changes up the mood and creates motion in a song. The 'Dominant 7th' chord has a very distinct sound and mood, all its own. Let's learn the formula for constructing this chord, and then explore how it sounds and functions in two different musical contexts, with play-along tunes. The key of D is a super-popular key in contemporary music, and yet, 2 of the minor chords likely to appear in this key are best played as barre chords. Let's integrate a minor barre chords into an easy song in the key of D. Don't let the occasional barre chord scare you away from great songs! When you place your barre chord root note on the 5th string of the guitar, you can create any major or minor chord that exists, using barre chord theory. Heads up: The major ones are tough to make, but the minor ones tend to fall into place more easily. Either way, it's important that you understand the concepts, even your tone has a ways to go! The key of G is super-popular in contemporary music. The most likely minor chord to appear in the key of G is a Bm, which is best played as a barre chord. Let's get comfortable playing an easy song in the key of G, and easing that Bm barre chord right into the mix. Let's become fully barre-chord-literate, and learn a powerful set of tips and tricks for navigating your way in and out of these chords with ease. Big concepts are coming together and paying off here, as we learn how the 'Magic L' will tell you exactly what major or minor chords to play for most any song, with ease and predictability! This is powerful stuff for jamming, songwriting, and playing tons of great music. Let's learn the foolproof 'recipe' for constructing a Minor Scale, and then listen to how that relates to the sound we get when we learn some essential minor scales, in open position. These scales are really pretty, and fun to play! The 'Grid-Style' minor scale allows us to play any minor scale that exists, using a consistent and moveable pattern. Learn this grid, and you can instantly play ANY minor scale that exists, just by placing the grid at different points on the neck of the guitar. In this tutorial, we'll have some fun with some challenging practice exercises for the minor scale. Get ready to put your minor scale chops to work, with these very musical scale practice exercises. Who said practicing scales should be boring? Every good boy does fine, right? Right! Let's learn how to read notes in standard musical notation, and how to play them on the guitar. Tablature is easy, but for guitar players only. Standard musical notation is the universal written language of music. Knowing which note to play is great, but we also need to know how long that note should last. This is the basis of rhythm, as notes move one to the next throughout a piece of music. Let's learn how the physical shape of the note indicates its timing. In this tutorial, we'll put your budding skills in reading music to work. We will learn to play the familiar melody, 'Ode to Joy', by Beethoven. AND, when we add harmony, and bass, and you will end up with a beautiful solo guitar piece to master. So far you've learned how to read music, one note at a time. But now, let's take a classic melody, and add not just one, but TWO harmony notes, sprinkled throughout the piece. You'll see how this will add up to a beautiful solo guitar piece you can read and play. Acoustic Fingerpicking 8: Picker's Goldmine! Acoustic Fingerpicking 9: Learn the Theme Song! Let's start by learning how to put your guitar into DADGAD tuning. Then we'll get right into learning some fun songs to play. DADGAD tuning offers up some interesting varieties in chord voicings and harmonies, most of which are no more difficult to play (and sometimes even easier!) than when the guitar is in Standard Tuning. Have fun with this adventure into alternate tuning! 5 traditional Christmas songs are presented with fingerstyle arrangements. Each song has an arrangement to accompany singing, and also an instrumental melody solo. Christmas Classics for Beginners: 13 Easy Songs! Play 13 classic holiday songs with just three chords. Single-note melody solos are also included. Use of a capo is recommended to adjust the pitch of each song to best suit your singing voice, and suggested capo settings are included. Lisa will show you how to play a simple strumming version of each song that is perfect for singing along with; either by yourself, or with your friends, family, and community gatherings. She'll also teach how to play a single-note melody version of each song. The single-note melody versions work beautifully as a solo instrumental, or to be played along with a friend who is playing the accompanying chords. This tutorial presents an acoustic fingerstyle versions of this classic Christmas carol. This version features chords and a picking pattern to accompany the singing part, and a melody riff to serve as an intro, and a spacer between verses. Lisa will show you each of these wonderful Winter Carols as a simple strumming version of the song that is perfect for singing along with; either by yourself, or with your friends, family, and community gatherings. And then, she'll also show you how to play a single-note melody version of each song. The single-note melody versions work beautifully as a solo instrumental, or to be played along with a friend who is playing the accompanying chords. This tutorial presents two acoustic fingerstyle versions of this classic Christmas carol. One version can be used to accompany singing the song. The other version is an instrumental melody solo. You may prefer one version over the other, or you may wish to learn both. They go together perfectly. Lisa will show you each of these wonderful Christmas Carols as a simple strumming version of the song that is perfect for singing along with; either by yourself, or with your friends, family, and community gatherings. And then, she'll also show you how to play a single-note melody version of each song. The single-note melody versions work beautifully as a solo instrumental, or to be played along with a friend who is playing the accompanying chords. This tutorial presents four versions of the song. For beginners, a basic strum-and-sing version is included, as well as a single-note melody solo. For intermediates, we combine the chords and the melody to create an instrumental version, both flatpick style, and fingerstyle. In this tutorial, the classic Christmas carol, "We Three Kings" is taught in four different versions. The strum and sing version is perfect for beginners. The easy melody solo creates an opportunity for an easy duet. And the chord/melody versions taught both flatpick-style and fingerstyle are a fun challenge for intermediate players. Learn to play a fingerstyle version of this traditional Christmas Carol, using a fingerpicking pattern in 3/4 time that you could sing with. And if you're a more advanced player, take on the instrumental melody solo for this beautiful holiday melody. This tutorial takes you step-by-step through how to play the original acoustic strumming song "Levitate", by Lisa McCormick. This includes the chords and strumming, tips and tricks, songwriting and composition comments, and a chance for you to play it along with Lisa's band, featuring YOU on the guitar. This tutorial takes you step-by-step through the skills and understanding needed to learn to play this acoustic gem, "At Seventeen" as made famous by Janis Ian. Fingerpickers will enjoy this jazzy challenge, and strummers can substitute an easy-going strum to enjoy this artistic arrangement of chord changes and powerful lyrics. We'll pick apart the intro riff, the verses and choruses, and put it all together in a play along with the "band"! In this tutorial, we'll learn and apply a basic 4-step fingerpicking pattern to the bluesy American traditional classic, "St. James Infirmary". We'll also learn a more advanced melody solo in two parts that you can use as an intro or interlude within the song. We'll finish it all off with a full play through so you can put it all together. Have fun! 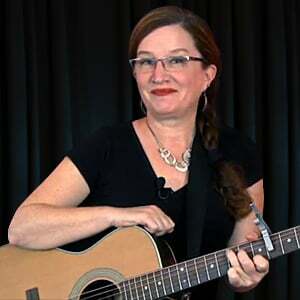 In this tutorial, Lisa McCormick will teach you the acoustic song "Hammer and a Nail" as made famous by the Indigo Girls. Lisa will first tune you in to the big picture, then start by teaching you the chorus of the song which is central to everything. Then you'll build the verse, and the intro to the song, followed by the pre-chorus and the outro. To cap it all off, Lisa takes you through three play alongs. In this song tutorial Lisa McCormick will teach you the parts to "The First Cut Is The Deepest". You'll learn the acoustic intro, verse arpeggio, chorus, some "ear candy", and do play-alongs designed for the acoustic parts. Then you'll tour through the electric guitar parts- the licks and riffs and solo, followed by electric guitar play-alongs. Create your own custom version by combining elements of these arrangements to suit your style and skill level. Lisa McCormick teaches you two complete versions of this song in this tutorial; one of these is played in an acoustic-rock strumming style, and the other is a fairly advanced fingerstyle version. At the end of the tutorial, there is a full-band playthrough, with no guitar in the mix. Why? That's your job! Learn the strumming version, or the fingerstyle version, or make up your own hybrid version and rock out with the band. In this tutorial we'll take a look at a wide variety of ways to play the classic party song "Happy Birthday", from very basic to rocked-out reggae. This is the the most recognizable song in the English language! Choose the style, skill level, and key that is the best fit for your guitar skills and vocal range. In this song tutorial, Lisa McCormick walks you through all the skills and information needed to play "Closer to Fine", as made famous by the Indigo Girls. Lisa will teach you opening acoustic guitar riff that hooks you into the song and continues through the verses, the chorus, and all the other musical details in the tune. Besides the guitar parts, we also look at the dynamics, vocal harmony, lyrical composition, and song structure. In this series of lessons, Lisa McCormick will take you through everything you need to know to play "Baby, I Love Your Way" as made famous by Peter Frampton. She'll start with the central riff first, then use the riff to teach you how to build the intro and verse. Then Lisa will delve into the pre-chorus and chorus, followed by a slow-mo playalong, and two final playalongs: one with Lisa, and one with just the band. In this set of lessons, you'll learn to add upstrokes to your strumming. This will open new possibilities in adding fun and groove to your playing. You'll also learn some classic ornamentation techniques that will give your playing a real country flavor. Learn the foundational skills of guitar strumming. The techniques you learn in this tutorial will set you up to become a master guitar strummer. This tutorial presents skills in a country music context, but these skills are equally powerful in virtually any contemporary guitar music style. Your band is waiting for you to tune up and play! These Song Projects allow you to put all your strumming skills to work, with four song arrangements to master. In this set of lessons, we get to the most powerful and versatile strumming rhythms. Learn these techniques well, and you'll be able to become a strong solid strummer in nearly any guitar style. The so-called "Ghost Strum" is an essential component of country style guitar strumming. Learn to incorporate this important skill into your country chops. You wouldn't head out for a 10k run without doing some stretches and warm-ups first, would you? Same thing with guitar. Wake up your finger muscles with these simple warm-up drills before you head into a practice or playing session, and you'll cross the finish line in fine style. Welcome to the Guided Practice Routine for Beginners. Here, you can practice right along with me, and I'll guide you the whole way. This tutorial is divided into 5 stations. For a good well-rounded workout, do the drills that are right for your skill level in each of the 5 stations. Customize your routine to fit your skill level, and the time you have for practicing today. Make this Guided Practice Routine for Beginners a part of your daily guitar playing! Cil Chais is an ancient melody that comes to us from the hills of Ireland, with all their mist and magic. This relatively uncomplicated acoustic fingerstyle version incorporates melody, bass, and harmony in such a way as to evoke a larger gathering of Irish musicians and instruments. We'll break the piece down and learn it note for note, then play it together all the way through, with a band joining us at the end. Have fun! In this tutorial, we'll take an overview of the whole tune. We'll talk about working in 6/8 time, and how to count ourselves in to this tune. I'll give you some tips and tricks to make learning and playing the tune easier. and then we'll finish up with 2 playalongs; one at a slowed-down pace, and the other up to speed with a backup band. Have fun! In this tutorial, we'll take an overview of the whole tune. We'll talk about working in 3/4 time, and how to count ourselves in to this tune. I'll give you some tips and tricks to make learning and playing the tune easier. and then we'll finish up with 2 playalongs; one at a slowed-down pace, and the other up to speed with a backup band. Have fun! Why can some people just pick up the guitar, and play a song they've never played before in their lives, seemingly by magic? Turns out the 'magic' starts with a very simple formula that you may have heard of, called "One, Four, Five", or, Basic Chord Theory. You'll be amazed at what you can figure out 'by ear' when you understand this easy formula! Get started now and you'll be rattling off songs left and right by dinner time.